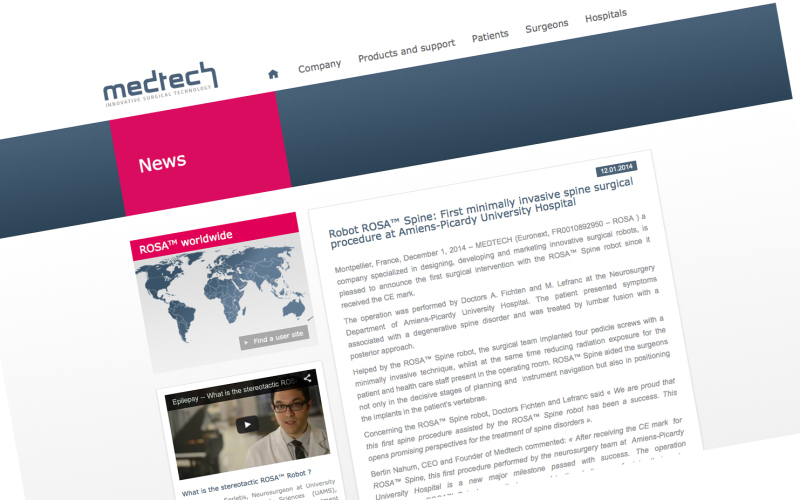 Montpellier, France, December 1, 2014 – MEDTECH (Euronext, FR0010892950 – ROSA ) a company specialised in designing, developing and marketing innovative surgical robots, is pleased to announce the first surgical intervention with the ROSA™ Spine robot since it received the CE mark. The operation was performed by Doctors A. Fichten and M. Lefranc at the Neurosurgery Department of Amiens-Picardy University Hospital. The patient presented symptoms associated with a degenerative spine disorder and was treated by lumbar fusion with a posterior approach. Helped by the ROSA™ Spine robot, the surgical team implanted four pedicle screws with a minimally invasive technique, whilst at the same time reducing radiation exposure for the patient and health care staff present in the operating room. ROSA™ Spine aided the surgeons not only in the decisive stages of planning and instrument navigation but also in positioning the implants in the patient’s vertebrae. Medtech shares may be incorporated into equity savings plans for small to medium-sized companies which benefit from the same tax advantages as a traditional equity savings plan.